Gymnastics—like many other other sports—taught me qualities that I’ll carry for the rest of my life, but there are some lessons I couldn’t have gotten from any other activity. Gymnastics provided me with some of the greatest times of my life—along with some of the worst. But it’s never something I’ll look back on with regrets. 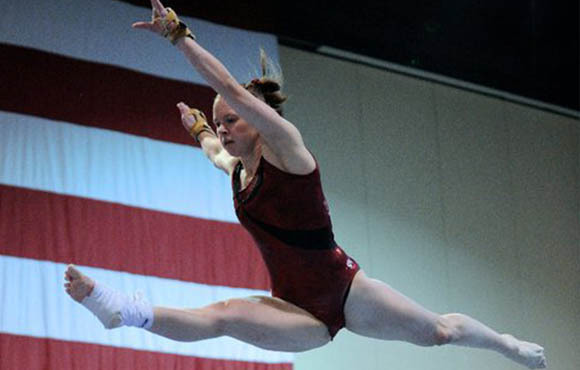 Gymnastics is one of the toughest sports in the world, making gymnasts some of the toughest athletes around. Sprain an ankle two days before a meet? You're back out there on Saturday in your leotard. Get a rip in the middle of a bar workout? "Can I take one more turn?" Gymnasts go through rolls of tape faster than Joey Chestnut goes through hot dogs on Coney Island every Fourth of July. I bought Icy Hot in bulk and became an expert at washing my hair with one hand during a post-practice shower—because getting a newly ripped blister wet hurts way worse than a little shampoo in my eyes. The lesson learned is this pain doesn't last forever. Eventually I healed and was rewarded for pushing through. 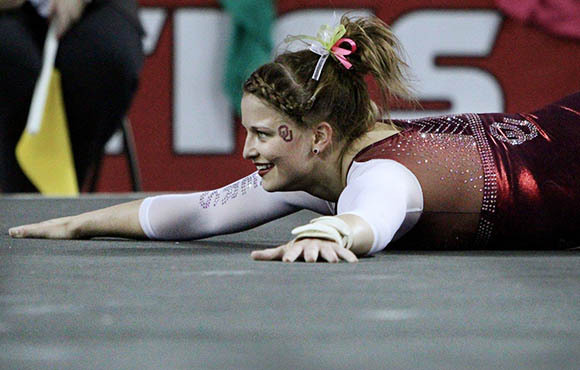 Gymnastics builds mental toughness, too. I couldn't have a wandering mind when I was doing backflips four feet off the ground on a piece of wood the width of an iPhone. I might have preferred intense conditioning to an hour-long practice on beam, but without mental toughness and perseverance to get through the fears and dread that came along with my least-favorite event, I would have quit years before earning the opportunity to compete at Eastern Nationals. 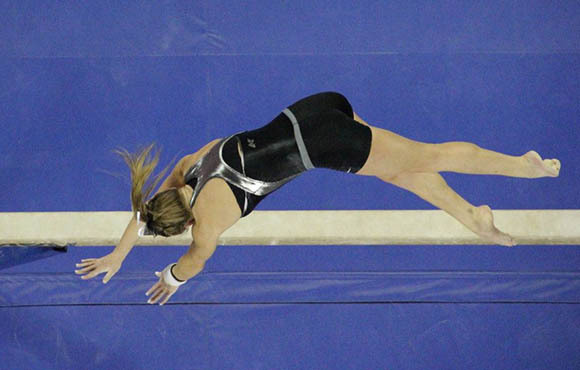 And that mental toughness doesn't just apply to the beam. In everyday life I receive criticism, face difficult people and have to push through things I don't necessarily want to do. A lot of Friday nights were spent in the gym instead of hanging out with friends, going to school dances or rooting on the ultimate frisbee team like every other kid was doing (my high school didn't have football). 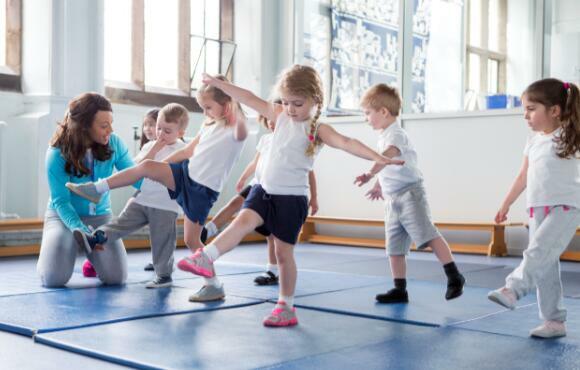 But I wasn't every other kid in my grade: I was a gymnast. And that's something not a lot of other people can say. And the truth is, after all is said and done, I didn't really care. I traded that hour and a half on the bleachers for a couple more reps on vault because it might mean moving up a level the following season. That said, I didn't do it to become the next Simone Biles. I stuck with gymnastics because of the feeling of accomplishment I got after hitting my back handspring for the first time on the high beam. Or the elation that coursed through me when I stood up my vault for the very first time. Plus, this doesn't mean zero social life at all. Taking a night off to go watch a movie or skipping a practice here or there to hit up the homecoming dance is perfectly acceptable. I know it helped keep me fresh and prevented me from getting burnt out on the sport I loved. Balance is key in gymnastics. Starting out, it may have seemed daunting to merely walk across the four-inch wide beam. But after just a couple months of practice, I was comfortable jumping, leaping and even flipping across the infamous event. Like on the beam, life requires balance. With so many things being thrown at me on a daily basis—homework, friends, chores—it's hard to keep it all straight. I couldn't neglect one side of my life to focus on another just like I couldn't lean even the slightest bit to one side while up on the beam or my next move would send me crashing to the floor. Gymnasts are good at time management and organization because we have to be. With seven hours of school, a five-hour practice, at least two hours of homework—along with, you know, eating and sleeping—it's easy to let things slip by. But gymnastics taught me how to get it all done and still have time left over. That car ride after school wasn't time to check Twitter; it was the perfect window to change into my practice leotard. Dinner wasn't about sitting in front of the TV and catching up on my shows; it was about finishing the homework I already started between classes at school. 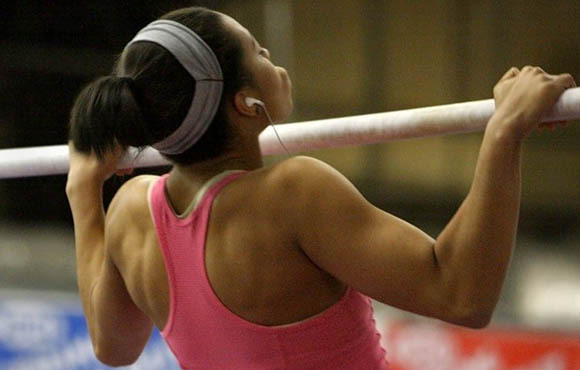 Multitasking becomes second nature to a gymnast and lasts long after she's hung up her grips. Yes, a fall can ruin a routine and seem like the end of the world. But the truth is, it's only five-tenths off a routine that starts out at a 10. So instead of focusing on the one bad thing, I learned to turn my focus to all the other good things I had control of from that point forward. Ultimately, it's what I learned from those mistakes—in gymnastics and in life—that make a misstep valuable and worthwhile. Falling was never the important lesson. It's whether I got back up and tried again. While it's true gymnastics is largely an individual sport, I didn't get to a high level without the support of my teammates. Going into the gym every day to train by myself is a much different experience than going in and being motivated by my peers to improve—not only for my own benefit, but also for the benefit of the team. Plus, if I was having a bad day, who better to pick me up than someone who knows exactly what I'm going through? Gymnastics is unusual in that it taught me to rely on others without becoming dependent on them. I could be part of a team while still striving for individual achievements because success was about improving myself to improve the team. One part doesn't work without the other. It's 2017, which means we're all about girl power. But even back in the early 2000s, I was totally content being the girl in P.E. who could show up all the boys on the pull-up bar. I owned the strength gymnastics gave me and didn't shy away from it. 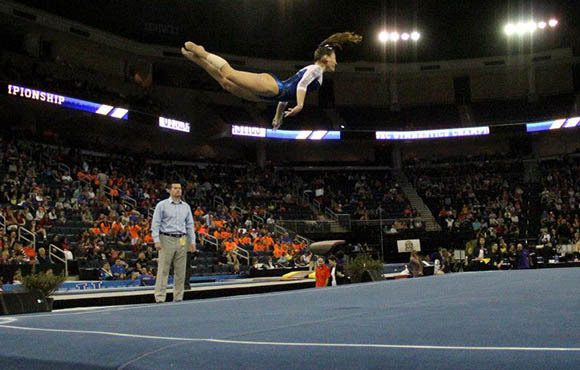 Gymnasts have real world super powers. How else do you explain the power of flight, super strength and elasticity? Not to mention the spandex. Being a gymnast is a badge of honor. We just choose to leave the cape in the closet. It's true. I thought it was a good idea to spray glitter all over my perfectly made bun for one of my first meets. But two years and over 500 showers later and I was still finding shiny specks on my scalp. Like glitter, gymnastics has stuck with me throughout my life. Once a gymnast, always a gymnast. Even five years removed from my "retirement," I still find myself doing beam choreography while waiting in line to renew my driver's license or throwing in a scrunchie when I'm having a bad hair day. Heck, I even used leftover hairspray to kill that pesky roach I found in my bathroom last spring cleaning. 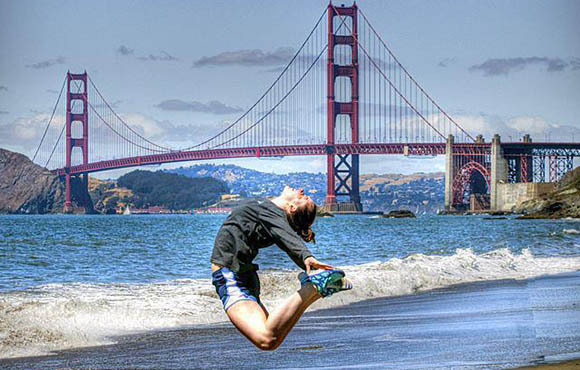 And if I visit a new place and don't take a gymnastics pose picture, was I even there? The life lessons I learned from gymnastics will stick around long after I'm past the age where it's acceptable to take a handstand pic in public. No matter how hard I fight it, I'll always be disciplined, always tough and always live a life of balance.